For an effortless game day snack, prepare the recipe 1 day ahead. To reheat, remove the biscuits from the cast iron skillet, wrap loosely in foil, and bake at 350° for 20 minutes or until warm. Place biscuits on a parchment paper-lined baking sheet; cover with plastic wrap and let stand at room temperature to thaw, about 1 hour. Stir together mustard and 1 tablespoon butter. Flatten biscuits on a floured surface to measure about 4 inches; brush with mustard mixture. Divide ham and 3/4 cup cheese evenly between biscuits. 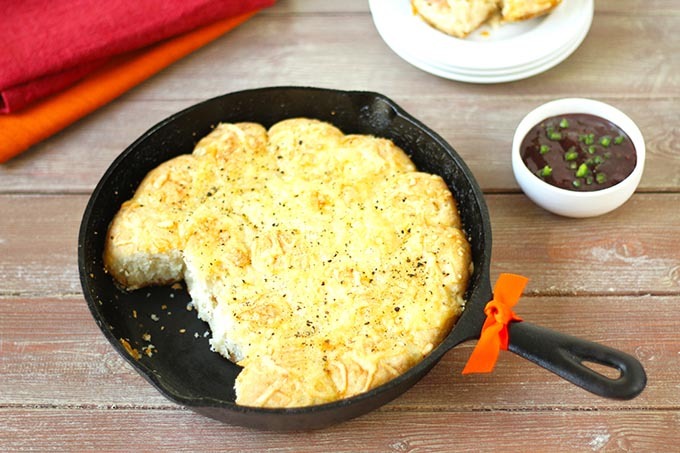 Pinch biscuit ends together and place seam side down in a lightly greased 10-inch cast iron skillet. Brush tops with remaining 1 tablespoon butter. Top with remaining 3/4 cup shredded Swiss cheese. Bake 40 to 45 minutes or until lightly brown. Sprinkle with freshly ground pepper. Meanwhile, stir together preserves and remaining ingredients in a small bowl. Serve with biscuits.